Circle Rug by Donna Hulka published in in Crochet Me: Designs to Fuel the Crochet Revolution by Kim Werker (Interweave Press 2007). This rug is crafted from individual circle motifs. The motifs are joined to form strips, which are then joined to complete the rug. 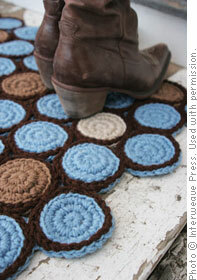 Because all joining is done by crocheting the pieces together, the construction is very sturdy.